The Investors Intelligence survey, a measure of investment newsletter editors from ChartCraft is basically unchanged once more. This week we have an absolutely equal amount both bearish and bullish (35.6%). For the previous 2 weeks, the bull bear ratio has been hovering around par and this week that continues once again. The last time the bull bear ratio was this low was in July 2009 and April 2009. This week the American Association of Individual Investors’ weekly sentiment survey had a decline in optimism. The bulls decreased from 39% to 32% while those expecting higher prices increased from 38% to 45%. According to Mark Hulbert, keeper of the HSNSI measuring the posture of short-term market timing newsletters, Thursday’s powerful advance did nothing to persuade newsletter editors to take on more exposure on the long side. One day, a trend does not make but this reluctance is noteworthy since normally advisers mimic the market, taking on more risk when it rises and pulling back when it falls. The NAAIM survey of active money managers was little changed with the average portfolio exposure at 45% long compared to 50% long last week. This metric is still coming off the lows of early July when it hit 13.5% - plumbing depths not see since March 2009. According to Gallup, the average US consumer is very worried about the future economic outlook. 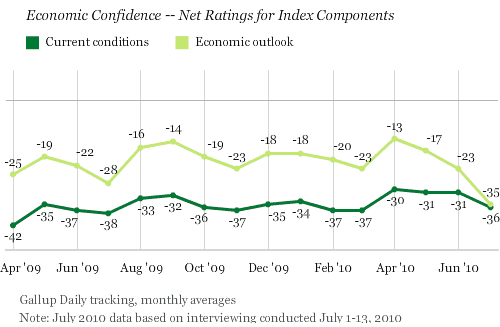 The recent decline in economic confidence began in late June, as a response to the sharp drop in the equities market. And finally, an increasing number of CEO’s are planning to increase hiring. According to the latest survey, 39% expect to hire new employees (up from 29% in April 2010) while only 17% plan on reducing their workforce (compared to 21% in April). Overall, the Business Roundtable CEO Economic Outlook Survey Index climbed to 94.6 in June from 88.9 in April 2010. Since the CEO index is a diffusion index, a reading above 50 indicates expansion. According to an independent analysis, the survey has predictive capabilities for GDP for the next two quarters. So we can add it to the list of indicators which would suggest that a double dip recession is improbable. Both the ISE Sentiment Index and the CBOE put call ratio are relatively neutral so let’s instead check in with the OEX Put/Call ratio. After falling to a low in early July, the short term (10 day simple moving average) of the OEX put call ratio has risen slightly to 0.833. 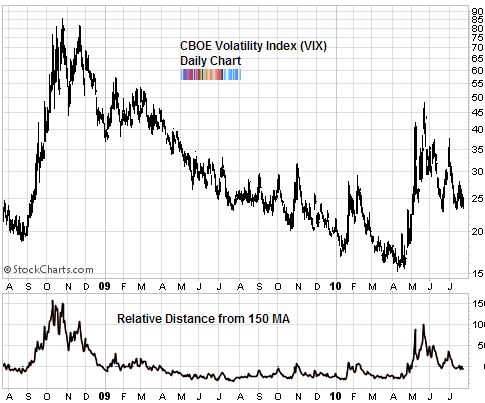 But the important thing to notice is that the 10 day moving average of the OEX put call ratio fell down to levels (0.80) not seen since March 2009, suggesting some serious concerns on the part of index option traders. .80 on the oex is bullish and would indicate call buying i am not sure why you say it indicates concern. Babak, interesting as it is every week. The bit about CEO confidence vs. consumer confidence is interesting. Maybe it means that corporations are expecting to sell more overseas even as consumers in the US are paring back? Or maybe consumer confidence simply reflects what consumers are doing now moreso than what they will do in the future? If I could only pick a single market timing indicator, it would be the action of the traders of the OEX options. If you look back to what finally called the bottom in the 2008-09 bear market, the 15DMA of these usually correct option traders fell below .80 for the first and only time during the entire bear market, and bottomed near .70 almost coincident with the final market low in March,2009. The 15DMA of these traders has fallen below .80 again in July, for the first time since the incident described above. This time it bottomed at .71. The current value of the 15DMA is .81. For the entire decline from June 18 through July 15, these option traders did not once buy more puts than calls. FWIW Consumers NEVER came out of depression other than transfer payments. Thus in view of ECRIs #s and other data, I am planning to interpret CEO behavior as a lagging indicator. Look at when the right time to buy was: when they were NOT spending. I also suspect that the hiring plans include a lot of overseas hiring, as that is where the markets are truly growing. The AAII bullish index seems to be a powerful indicator. I have checked the record back to January, 2002. With a single minor exception in January 2008, whenever this indicator has flashed a bullish index below 28% bulls, the subsequent rally continued at least until the bullish index rose above 60%. Most times it required readings well above 60% to stop the rally. With a recent bullish reading of only 21% flashed during the week of July 8, I would expect the current rally to also continue until a bullish reading of at least 60% is recorded. I suppose you can rely on the January, 2008, exception, but I won’t. Even the bear market rallies in 2008 which were signaled by low bullish readings required a complete reversal of sentiment to stop them. I need to make a minor correction to the note above. I was actually looking at the AAII bull ratio (bulls divided by bulls plus bears) instead of the bullish index. On July 8 this ratio was 27%. Otherwise the note is correct. Where can I find the OEX Put/Call ratio data?